Cleaning the print head on a Canon printer is a very straight forward task. Up until recently most Canon printers had removable print heads so cleaning was a very straight forward procedure. If your Canon printer is more than a year old then the following procedure should work for your printer. 1. With your printer turned ON and the cover in the open position wait until the print head carriage moves to the centre of the carriage and stops there. 2. 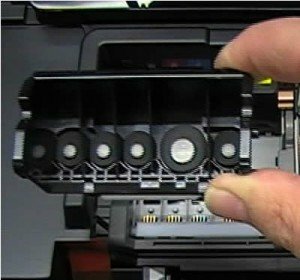 Remove all ink cartridges and carefully place them on a paper towel or similar taking care not to leak ink everywhere. 3. Gently lift the small lever (usually on the left side of the print head) to the vertical position which should unlock the print head from the printer. 4. Remove the print head and place it on paper towling. Take it to the kitchen sink and place it under the sink tap and allow warm water to gently flow through the print head from the top (ink cartridge side) and thoroughly flush out each colour nozzle until all dry ink has been removed. 5. Once fully cleaned allow the print head to dry and then reinstall the print head and inks and run several cleans. 6. Finally print several test pages and make sure that the print quality has returned to normal. What causes the print head to become blocked? There are a number of reasons which may contribute to a print head becoming clogged. 1. Infrequent use of the printer. 2. Use of very low grade generic ink cartridges. 3. Constant printing in black and white and very few images. 4. Leaving the printer sitting around for extended periods. 5. Running your inks until they are completely empty and not when prompted. 1. Print regularly and at least one full page image per week. 2. Use high quality Compatible Ink Cartridges. 3. Don’t set up your printer near a window where it will receive direct sunlight. 4. Remove the print head once a year and flush it out (using the procedure above). 5. If you are running a ciss or continue ink system gently shake each tank on a monthly basis. This stops sediment from forming at the bottom of the tank and flowing into the print head causing blockages.